← Are You Really Hearing? I recently read a story about Charles Spurgeon, the 19th-century British evangelist, who was conducting a boys Bible class on the book of Daniel. Sounds like the kind of mistake too often found in ThePreachersWord. However, while it was an incorrect rendering, it was pretty good theology. Daniel was a man of backbone, courage, and conviction. But his decisions and determination resulted from his focus and purpose in life. Purpose is vitally important in life. It gives us direction. Provides motivation. Supplies courage. Supports your passion. And regulates your decision-making. The word purpose has become a buzz word today. Churches, preachers, and authors often speak of being “Purpose Driven.” But that concept did not originate in pop culture. Daniel was a purpose driven prophet. He was driven by God’s purpose for his life. Compelled to a higher level of living. A nobler moral standard. A Divine decree. We are not told what royal “delicacies” were a violation of God’s dietary laws for the Jewish people. 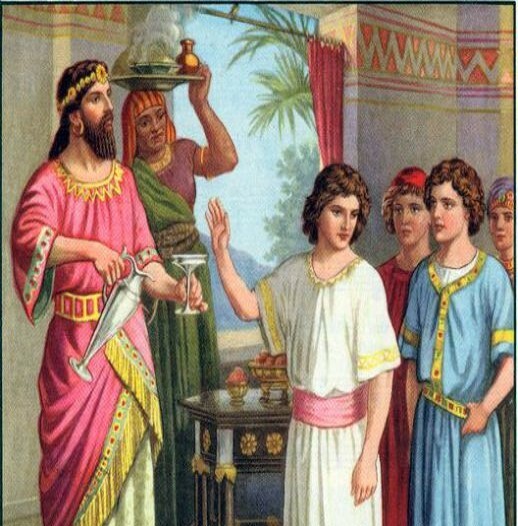 But apparently, there was food offered to Daniel that violated both his conscience and the Law of Moses. So, he refused. Daniel’s denial of the King’s bounty was driven by his purpose to please God. In fact, in future encounters in a foreign land, we observe Daniel’s backbone when he confidently stood before the King to interpret his dreams and give God the credit. Later, when King Darius decreed that it was unlawful to pray to any other “god” than the king, and the violators would be thrown into the lion’s den, Daniel was unfazed. And unafraid. He continued his practice of prayer to Jehovah, three times a day. He was undaunted in his purpose. The threat of the savage lions not withstanding. More subtle are the influences that are not inherently sinful, but can lead us away from the Lord, weaken our resolve and compromise our Divine purpose. It may be sports. A career. A hobby. Or even our family. Let us never forget that by the grace of God we have been saved and called for His own special purpose (Eph 1:11; 2 Tim 1:9). While C. H. Parkhurst was right, “Purpose is what gives life meaning,” it is God’s eternal purpose through Jesus Christ and offers us spiritual significance both in time and in eternity.